The study warns that winter temperatures could increase by up to 5°C by 2080, and summer temperatures by up to 6.5°C. Increasing extreme weather would lead to more droughts and more flooding. Although the growing season of some plant species will be extended, more mowing, weeding and pruning will be necessary. Heavier rainfall could also wash nutrients out the soil, meaning the timing of fertilisation will be crucial. Pests and diseases will spread more easily in warmer conditions, with new invasive species becoming established. A survey of more than 1,000 people was analysed in one chapter of the report co-authored by Dr Alastair Culham, Associate Professor of Ecology and Evolutionary Biology at the University of Reading. It showed that while most gardeners believe climate change is happening, only 2% feel prepared to deal with the impact. 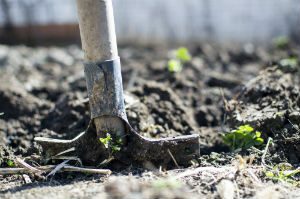 Gardeners, says the report, can reduce their carbon footprint by using water butts, avoiding petrol tools, chemicals and composts that contain peat. They can also actively remove carbon dioxide from the atmosphere by planting trees and plants and choosing a diverse range of plants to help boost the positive actions of pollinators. One option for gardeners as conditions become less favourable for grass is to have grass-free lawns. Previous research carried out at the University of Reading has shown these can produce up to 90% more flowers and boost the population of insects and pollinators, as well as requiring less mowing and no chemical treatment. 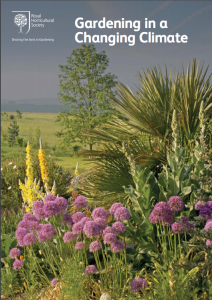 “This report provides timely and valuable guidance on the changes that we are all seeing in our gardens and the wider landscape. “Our variable climate has long been a challenge to gardeners, and climate change over the next few years will make gardening more uncertain. “Gardening is perhaps the most hands-on way that many of us interact with nature. This report reminds us how climate change is altering the balance of nature, with evidence growing almost everywhere we look. “Scientific understanding of the impacts of climate change is much more sophisticated than it was 10 or 15 years ago. We knew that global warming would lead to increased average temperatures, but we now know more about how the heat is building up and its effects. In the UK, it is likely that the most serious impacts will occur as a result of more extreme weather events, as our normal patterns of weather are disrupted. “This report serves as useful reminder that climate change is not just someone else’s problem. It affects us all, and can be affected by us all, gardeners included.